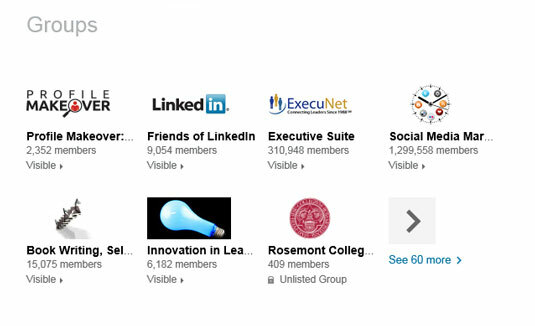 The groups you join on LinkedIn are listed toward the bottom of your profile in the Groups section. The group logos appear in a grid pattern, showing your reader your online involvement in your industry and community. The LinkedIn Groups you belong to appear in the Groups section. LinkedIn Groups are forums devoted to discussions around a single topic. When reading your LinkedIn newsfeed, you see status updates with discussions, quotes, and links to articles about a myriad of topics. With such a wide range of topics taking place, some people find it overwhelming. On the flip side, when you visit a LinkedIn Group, the discussions are focused on the Group topic, ensuring your interest in the discussions taking place. When you join the groups that interest you, and you engage successfully, LinkedIn Groups provide you the ability to forge new business relationships with like-minded professionals. Within the group, you can post news, participate in discussions, and network. It is a great way to add value and learn from others. The only issue when it comes to LinkedIn Groups is your own time limitation. There are a slew of LinkedIn experts and professionals who claim to use LinkedIn Groups to find amazing business opportunity. There is certainly business to be mined, but it takes time and energy that not all of us have in abundance. If you have the time and enjoy interacting in group discussions, do it and reap the rewards. On the other hand, if you are a busy person and do not have the time nor inclination to engage in group discussions, there is another way for you to take advantage of LinkedIn Groups in a passive way that provides real results. It is not a well-known fact, but LinkedIn Groups expand your LinkedIn network. Your LinkedIn network is comprised of connections within three degrees. The people you are directly connected to by exchanging and accepting a LinkedIn invite are considered your first-degree connections. The people directly connected to your first-degree connections are considered your second-degree connections. The connections of your second-degree connections are considered your third-degree connections. Your LinkedIn network is also comprised of the members of groups you have joined. When you perform keyword-based searches on LinkedIn, you are only searching your LinkedIn network. In order to find people and get found, you need to have an extensive network. The fastest and easiest way to expand your network is through joining LinkedIn Groups. People in the same LinkedIn Groups as you are considered part of your LinkedIn network even if they aren’t first-, second-, or third-degree connections. You can join up to 100 LinkedIn Groups. It’s recommended that you join 100 groups so you can strengthen and expand your network as wide as possible. Simply by joining groups, you receive the massive benefit of expanding your LinkedIn network. When you have a strong, large network, you get more views to your profile and collide with more opportunities. You do not have to participate in every single group you join. The only thing you need to ensure is that you join groups that contain your target audience.